Wind 'n Swim Turtle is rated 4.2 out of 5 by 16. Get a Grip on Playtime.™ It's hard not be shell-shocked - but this little Oball™ can swim! 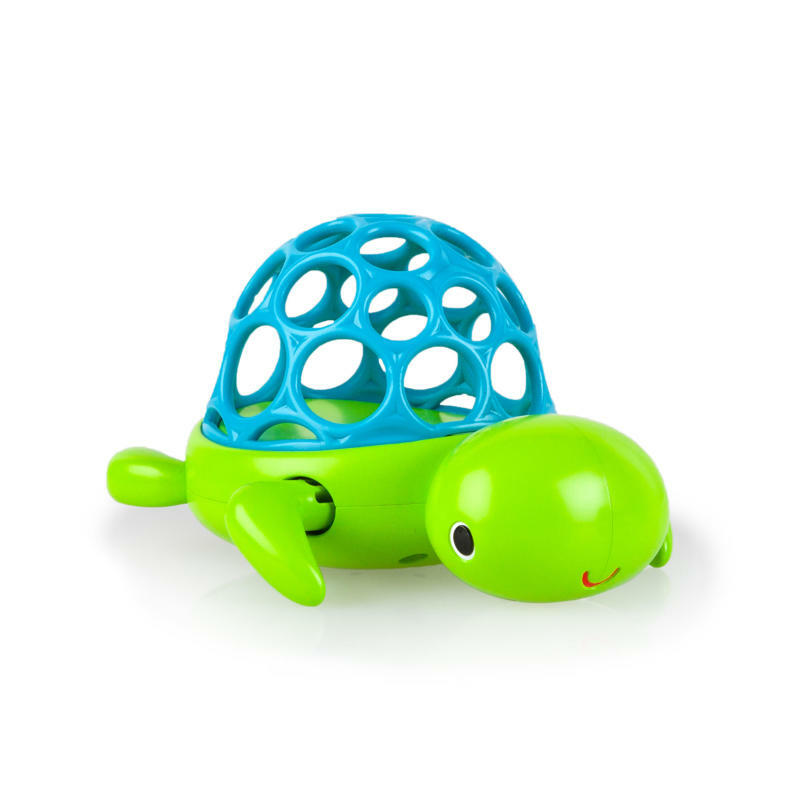 The Wind 'n Swim Turtle™ from Oball™ swims through your bath tub when you wind him up! His shell is made of those signature Oball geometric holes that give little fingers the ability to pick up and grasp this friendly turtle. Baby will love watching it swim and plucking it out of the water. The holes are ideal for quick drainage and clean up when bath time comes to an end. Baby's bath time just got a lot more interesting! Dimension (in) 3.5" x 5.2" x 3.5"
Rated 5 out of 5 by babyboymom from Adorable bath toy! This is a great addition to my son's nightly baths. He loves watching the turtle swim through the water. The shell of the turtle is designed perfectly for him to pick up and play with the turtle. Great product! Rated 5 out of 5 by brittany131 from Interactive & cute bath toy! I previously had a bunch of rubber duckies and other animals as bath toys for my almost three year old and 7 month old. Now we have the Wind 'n Swim Turtle and bath time is more fun! My toddler loves playing with it and asks me repeatedly to wind it up again. My 7 month old loves watching it swim and the outer shell of the turtle is perfectly made for his little hands to pick it up. This is an excellent toy if you're looking for more interactive fun for bath time. We love it! Rated 4 out of 5 by Augymnast from Fun for all I have two girls ages 2.5 and 1 and they both are girls and love this toy during bath time. It has a nice design so the kids can grab ahold of it in the bath and hold it. Rated 5 out of 5 by Brittyj from Good quality This toy seems so much more sturdy than other bath and wind-up toys we have purchased. I like that you wind by the fin instead off having to hold by a tiny dial. It keeps my son's attention in the tub, and he loves to chase and splash after it! I see us bringing this to the pool and beach come this summer as well! Rated 5 out of 5 by Jade from Great toy from young children I got this turtle for my four young kids (ages 3,4,5, and 4 months). This proved to be perfect for all of them! Wind the front flippers for a few seconds, stick him in water, and watch him go! Make sure each of the front flippers are facing opposite directions, or he can't move well. I love the dual purpose of the shell. It is hollow, which is great for little hands to pick up, and it avoids water getting stuck inside and causing mold. I have have to throw out several toys in the past due to mold, so I am glad this one will not have that issue! Rated 5 out of 5 by Cmsauer16 from Fun Tub Toy! I received this bath toy for my 8 month old son to test. He immediately loved it! I'll admit, the wind and swim function was a bit lost on him but I'm sure an older child would enjoy that. He preferred to "taste" it and splash it into the water. Rated 4 out of 5 by Leslie from Too cute!! My daughter loves it!! She spotted it on the kitchen counter and has played with it inside and outside of the tub. She keeps saying open open. It would be even better if it opened up and they could put stuff inside the turtle. Thank you for the turtle!!! Rated 5 out of 5 by Tc1208 from Lots of fun We got this turtle and used it at bath time he very next night. We've got O-ball toys already, but we were excited to get one for the bathtub. The boys loved watching it swim around. The only downside was that my youngest didn't understand how to make it go, but he didn't care. He loved to watch it! It's an excellent quality toy and it clearly will last us for many baths to come.